I came up with this option for my very occasional espresso or coffee drink because my counter space is too precious to keep my espresso machine on hand. It's easy to run to a neighborhood coffee shop for the espresso or coffee, but what to do about the foamed milk? I find coconut milk much too strong (and thick) to use as creamer, so here's my solution, which is so good I don't miss the "real" thing! In a small saucepan, mix together the milks. Gently heat the milk mixture while stirring until it reaches the desired temperature. Remove from heat and stir in the honey to taste and the vanilla if using. You can steam the milk with an espresso machine if you have one handy, or you can froth it with a hand blender by gently lifting the blender to the surface while it's running to form bubbles. Do this slowly and carefully as it can be extremely messy. Pour the mixture into a tall glass. Sprinkle nutmeg on top if desired. 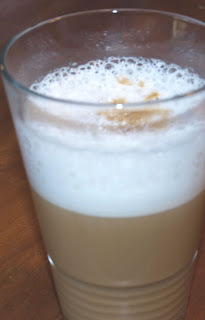 The milk mixture also works well as a coffee creamer and makes a good cafe au lait. In the summer, I plan to blend the nut milk with frozen coconut milk in the blender to make an iced latte. You can experiment with various flavoring extracts (such as almond) if you are feeling adventurous.